Lee Daniels' The Butler is high on my list of movies to see. However, when I first learned about it (prior to Lee Daniels' name being added), I thought the story had been inspired by a novel. Then I learned that it was actually based on the biographical account of Eugene Allen. From what I've read, the movie differs considerably from Allen's life by adding drama to an already beautiful and emotional story! If you're interested in learning the facts from the fiction, here's an excerpt from Douglas Cobb's article Fact and Fiction in Lee Daniels's The Butler, which appeared in the August 17, 2013 issue of The Las Vegas Guardian Express. Click the link for the full story. ...While the actual White House butler, Eugene Allen, was born and grew up on a Virginia plantation in 1919, this setting is substituted in the movie version with the fictional White House Butler Cecil Gaines being born and growing up in Macon Georgia, where he worked in the cotton fields. ...Another place where the facts of Allen’s life are somewhat different from the fictional version of his life in the movie is that, in real life, Allen had a wife and one son, Charles Allen, while in the movie, he is married, but has two sons. The actual Allen met his wife, Helene, in Washington at a birthday party. Gaines, on the other hand, meets his wife, Gloria, at a Washington hotel where they both work previous to Gaines landing his job at the White House. The way that Allen heard of the job opening was through a woman telling him about it in 1952. He wasn’t looking for a new job at the time, in that he was fine with the job he had, at a Washington country club. Also, Allen did not begin working as a butler from Day One at the White House; rather, he started off as a pantry worker and was later promoted to the job of the butler. Cecil Gaines, in the movie, gets his job as the White House butler after first serving as an administrator of the White House in a hotel restaurant. One of the many instances where the facts of what happened in Allen’s life are accurately depicted in the movie is both the real and movie butlers receives a tie of President John F. Kennedy from Jacqueline Kennedy after JFK’s assassination. As well, both butler versions were working in the kitchen of the White House on the day of Kennedy’s assassination, the same day Jacqueline presented both with a tie as a gift, and a memento. Both Allen an Gaines get invited to Kennedy’s funeral, but both volunteer, instead, to stay behind a the White House, reasoning that someone had to serve the attendees as they returned from the funeral. One place where there’s a major difference in the film’s depiction is that Charles Allen, Eugene’s son, was not the Black Panther and political activist that Gaines’s son is in the movie. Also, Charles never ran for a political office, whereas Gaines’s son does. Though there was some tension between Allen and his son over certain civil rights issues, in real life Charles Allen worked as an investigator for the State Department and never ran for public office. The movie’s Gaines, as well as the actual White House butler, Allen, were invited by President Ronald Reagan and Nancy Reagan to a state dinner at the White House.The state dinner was for the West German Chancellor Helmut Kohl. Also, both Allen and Gaines are supporters of Obama when he runs for the office during the 2008 presidential election. Allen and his wife had been married 65 years at the time. He was given a VIP invitation to President Obama’s inauguration, according to the article in Times, and he cried as he watched the ceremony. Adding more drama always makes a true story more exciting! Have you seen Lee Daniels' The Butler yet? If so, what did you think? By the way, if you like the time period depicted in Lee Daniels' The Butler, try The Governor's Sons--historical fiction with lots romance and suspense. Please excuse my shameless self-promotion! This is a post from "the archives". Hope you enjoy it for another round! Along with reading and writing, watching movies is one of my top favorite past times! Dream weaving and illusion contribute to making enjoyable movies. I love watching stories unfold and listening to the characters. But what makes a line of movie dialogue, or even just a single word, timeless and unforgettable? What makes it so memorable that it's often quoted in real life, other movies, television and even kids' cartoons? Perhaps it's spoken during a suspenseful situation, or in a scene where love has gone wrong. Maybe it's exclaimed in the thick of danger, or during the thrill of excitement, or in the midst of a conflict about to explode. It could be line akin to a sigh of relief, spoken at the very end, when all problems are resolved. With a skilled screenwriter and an amazing story, all of these elements can create exciting dialogue and at least one immortal line that leaves the audience saying, "I loved it when he said..."
As a lover of history and author of historical fiction, I thoroughly enjoy visiting historic homes. They're great for research and just a fun way to get lost in the past! Okay, so that all sounds fine and good, but my kids hate history! 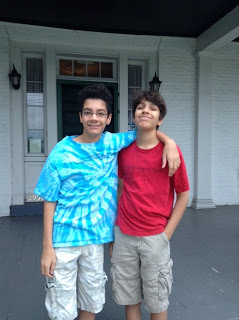 Regardless, during summer vacation I dragged them over to The Harriet Beecher Stowe House. It's less than ten minutes from where we live, and I thought it would be a great living history lesson for them. "How exciting," I said, "to walk in the same house that Harriet Beecher Stowe actually lived in. We'll walk on the same floor, climb the same steps, and walk on the very grounds she strode!" I reminded them that she's the author of Uncle Tom's Cabin, a book partly responsible for bringing about the Civil War due to its realistic portrayal of slavery. She brought to light the truth about the "Peculiar Institution" that so many Americans were unaware of. While living in Cincinnati she met slaves. She visited Kentucky, which is right across the Ohio River (today about a ten minute drive from the Stowe House), and saw the conditions to which slaves were subjected. Her time in Cincinnati inspired her to write Uncle Tom's Cabin. 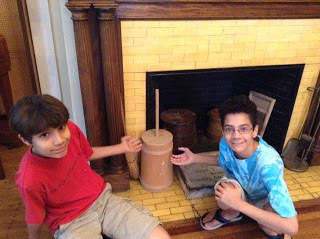 My boys were much less enthusiastic than I was about our field trip, but despite their initial protests, they enjoyed the self guided tour we had. They even stood still long enough for me to read some of the display materials to them. 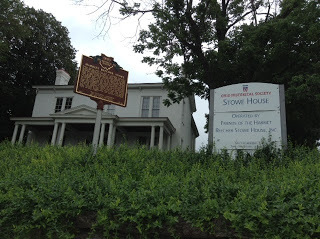 Here's a little history about the house and Harriet Beecher Stowe's life in Cincinnati. Mrs. Stowe lived in Cincinnati for nearly twenty years. The house where she lived, now known as The Stowe House, was completed in 1833. It was built as the residence for the Lane Seminary President, and its first occupants were Harriet's family, headed by her father Reverend Lyman Beecher, who moved his large family to Cincinnati in 1832. Lane Seminary was an influential Presbyterian college and religious seminary in the 1830s and 1840s. It was also the first US college and seminary to admit a black student, James Bradley, a former slave. Students of the seminary went on to become educators, ministers, abolitionists, and social reformers. After Harriet married Lane professor Calvin Stowe in 1836, she moved nearby, but visited the house frequently, and her first two children were born there. Every city and town has history to share. Are you close to a piece of living history in your area?